Biking home from work this evening, I couldn't believe it. 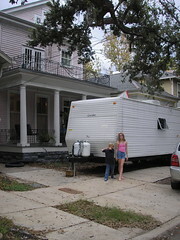 There in our front yard was our very own FEMA trailer. It still needs to be "hooked up," which can take months, but it was exciting to see the trailer nonetheless. Now my kids can have the full Katrina experience. Gilgamesh wanted to eat dinner in the trailer, and we tried, but it smelled too much like formaldehyde and we got sick so we went back to our house. 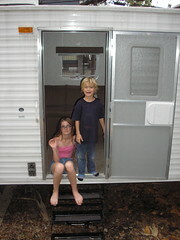 But someday soon, we'll be ready to go in our FEMA trailer. On that day, only Allstate will be to blame for us not moving forward in the long and arduous rebuilding process. Some of our neighbors are almost ready to move back into their houses, and some already have. We are planning on about two years once we are able to start, as our structural damage and all the other work will be pretty extensive, and contractors are hard to come by. Welcome to the trailer park. I dunno Therese and Kalypso are too elegant to be called trailer trash. As for the men in the family...no comment.